Looking for a way to differentiate in your music room? 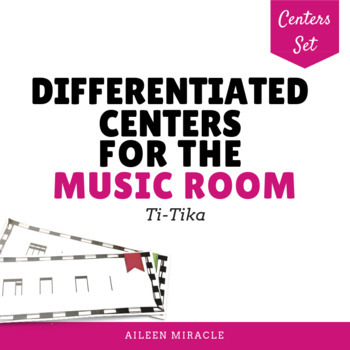 This centers set is perfect for differentiating while practicing ti-tika or ti-tiri (one eighth/ two sixteenth notes). Each center includes three levels (basic, proficient, and advanced); students complete the task for whichever number or color they are given, depending on the data collected, so that their challenge is "just right" for them! 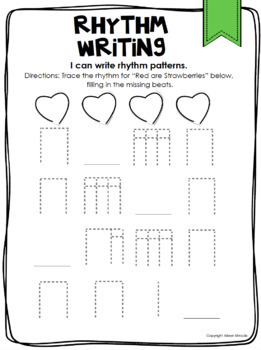 Purchase this at a discount with my Differentiated Music Rhythm Centers Growing Bundle! Pre-test for ti-tika: This fun "Mythical Creatures" game has students identifying which beat is not notated correctly. You can use the data collected from the assessment results to differentiate during centers! Data differentiation sheets: Includes sheets for pre-test, mid-check, and post-test, so that you can indicate which students are at levels 1, 2, and 3. Also includes a sheet to record the progress of an entire class. Center checklists: Allows students to keep track of which centers they've completed, and to indicate whether the centers were just right, too easy, or too hard. Also includes an editable version. 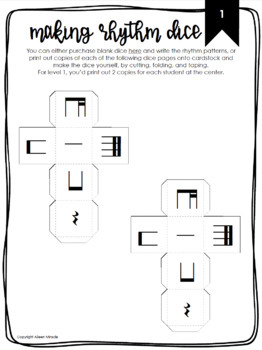 Rhythm dice: Depending on the level, students roll the dice with rhythms and write the rhythm pattern, or roll the dice and write the rhythm pattern and fill in missing rhythms with rhythms of their choice. Dice templates are included for printing onto cardstock and assembling, or a link is included to purchase blank dice on Amazon. Versions for writing the rhythm patterns include numbered versions with and without names and colored versions with and without names, as well as versions for stick and standard notation. Rhythm flashcards: Includes levels 1, 2, and 3 flashcards, with numbers and with colors. Students choose a non-pitched percussion instrument, play the patterns for their number or color, and then choose a different non-pitched percussion instrument and play the patterns again. 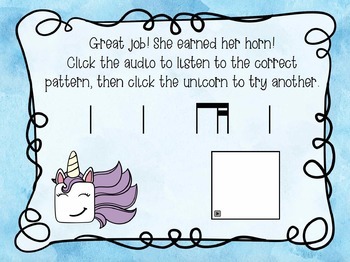 Picture rhythms: Students use an iPad or Chromebook to scan the QR code on the worksheet and write the one-beat, two-beat, or four-beat rhythm patterns for the pictures, depending on the level (i.e. for "flower/ brown rabbit/ cloud/ flower," students would write "ti-ti ti-tika ta ti-ti.") An answer key is included so students can check their work. Directions for the set: Includes directions for centers, with information for station rotation as well as having students choose their centers. I've also included information about how I store my centers materials. Thanks for looking! You can read my blog at www.mrsmiraclesmusicroom.com.